Enter to Win a Wall Mounted Cat Bed From The Vertical Cat! Here’s your chance to win an awesome wall-mounted cat bed from The Vertical Cat! This bed gives your kitty a place to call her own and makes a great addition to your cat superhighway! The bed comes in two styles, regular and deep. Both styles come with either a soft pillow or carpeting inside to make them extra cozy. The beds attach securely to the wall, providing the perfect perch for kitty. The regular bed creates an easy lookout, while the deep bed makes more of a cocoon, but cats still have easy access through the cutout on the side. The cutout can be positioned on either the left or right side, you choose! The winner will get to pick the bed style as well as one of The Vertical Cat’s many finishes and carpet or pillow colors. 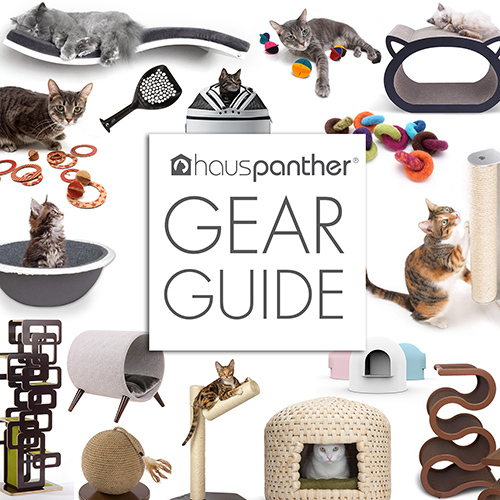 There are so many choices, it’s easy to customize their cat furniture to match your decor! Visit TheVerticalCat.com to see all the options. To enter the weekly giveaway, please visit the Hauspanther Giveaway page and complete the entry form. The deadline to enter this week’s giveaway is midnight Pacific Time on Sunday, July 19, 2015. This giveaway is limited to addresses in the US. Groom Genie Winners PLUS Get $5 Off! This company builds solid furniture. We have The Vertical Cat Sisal Rope Scratching Post w/Cat Bed and it is wonderful! We got the extra tall 36″ with a big bed on top (this big bed is similar to the wall mount beds shown here) and the cats love it. The entire device has a broad, heavy base: there is no way they can knock it over. Wow, what a great contest! Heading right over to enter, with thanks!